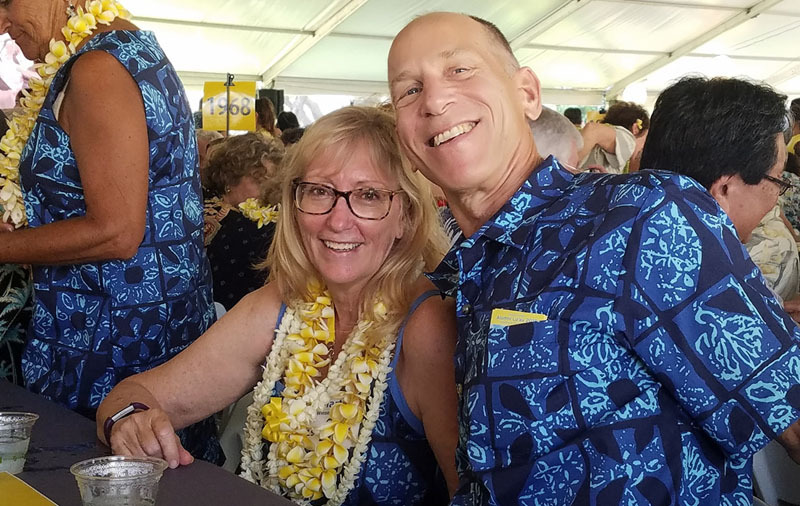 In honor of her 50th reunion, Marti held her usual Ho’omaluhia art show a couple of months early to allow her to share it with her classmates. 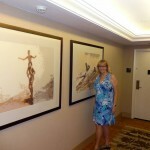 It’s been an annual tradition for approximately 20 years to show her artwork at Hoomaluhia. 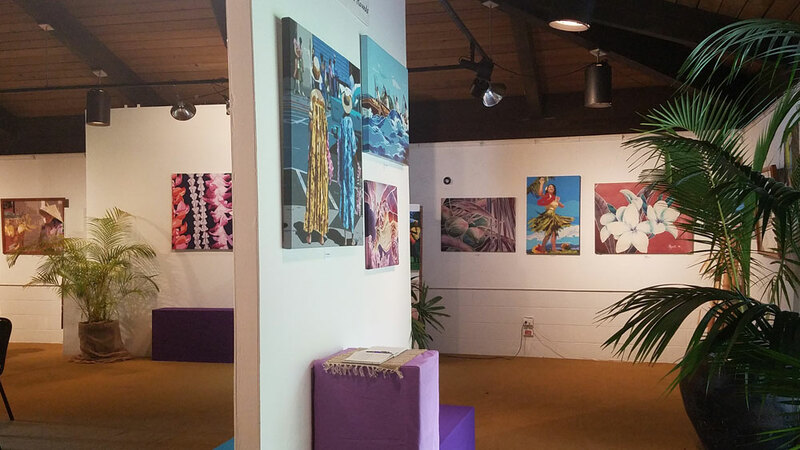 Soft, lovely batiks, and vivid acrylic paintings hang in a beautifully staged show complete with potted plants from Marti’s garden and ikebana floral arrangements from Hoomaluhia flower arrangement classes. As usual, her show is excellent and features some beautiful new work. If you can, you should plan a lunch break to Hoomaluhia to catch the show before Saturday, June 30 when the show will be changing. Open daily 9 am – 4 pm. 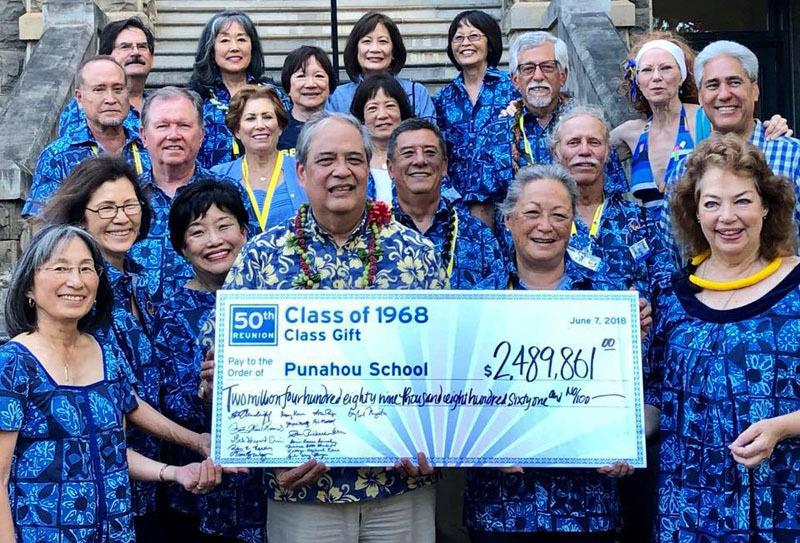 One of Marti’s most interesting recent projects was to select and design a fabric, contribute revisions to the design of a t-shirt graphic, and translate the graphic to a banner graphic (seen below) for her 50th reunion at Punahou School, one of Hawaii’s most prestigious schools. 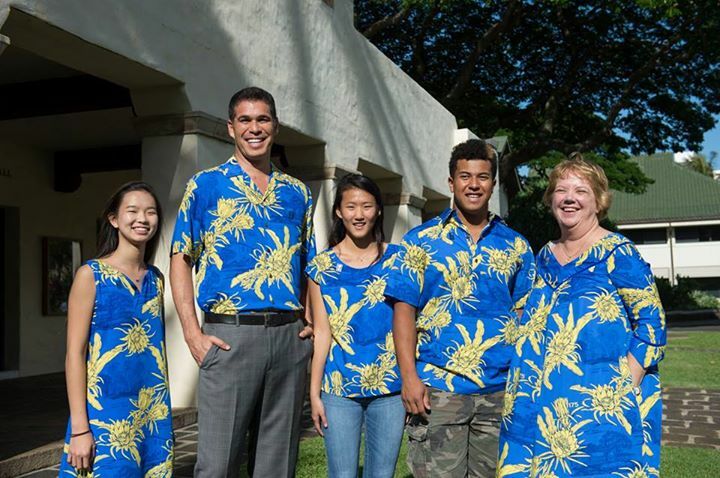 Punahou has a tradition of diverse and beautiful fabric designs. School spirit is off the charts, so the whole class will usually invest in some fabric and make dresses, shirts, bags, table runners, etc… from the fabric. A couple of years ago, Marti’s design with night blooming cereus, and a vignette of the school was lauded for its excellence. This time, she wanted to evoke some nostalgia with the shirt design, so she opted to revive a classic fabric, originally by Alfred Shaheen circa late 50’s to 60’s. Since printing is digital now, there is no way to simply continue making new fabric from a vintage print unless you are willing to draw it all over again in the correct digital program to modernize the printing files. Marti did an amazing job of interpreting the original fabric design. The classic shirt print had 36 squares, but Marti changed the type of repetition and dropped the count slightly to 30 blocks. One of her amazing talents is her broad knowledge of Hawaiian fabric designs and the trends today and over the span of her career as an art director and designer. This ability to select and adapt the classic Punhou pattern resulted in a snazzy-looking (and very generous) class! Congratulations Class of ’68! What a fabulous reunion! Marti in Midweek; Marti at Hoomaluhia! What an eventful time for Marti! 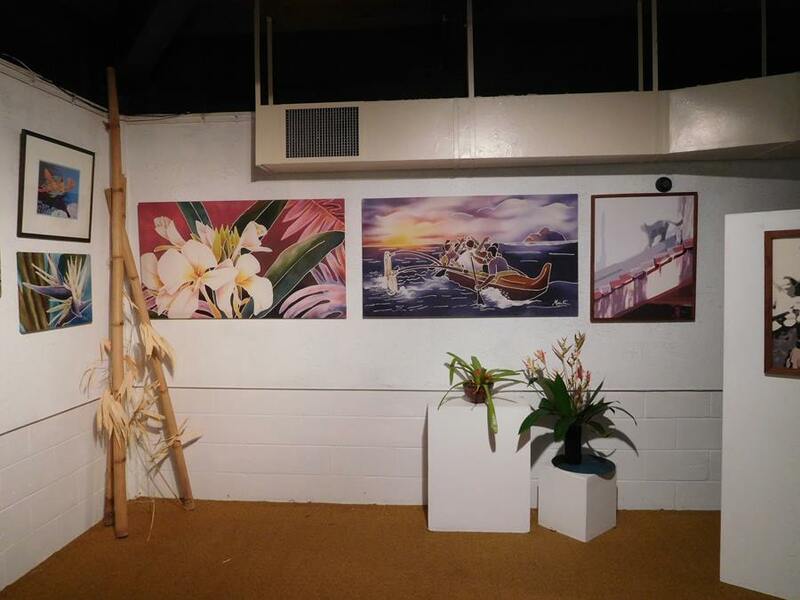 In June, the Punahou reunion held an alumni art show that Marti participated in. In September, she was in Midweek, featured in “Long on Art” column for September 6, 2017 – in time to remind everyone to go see her beautiful, vibrant show at Hoomaluhia. 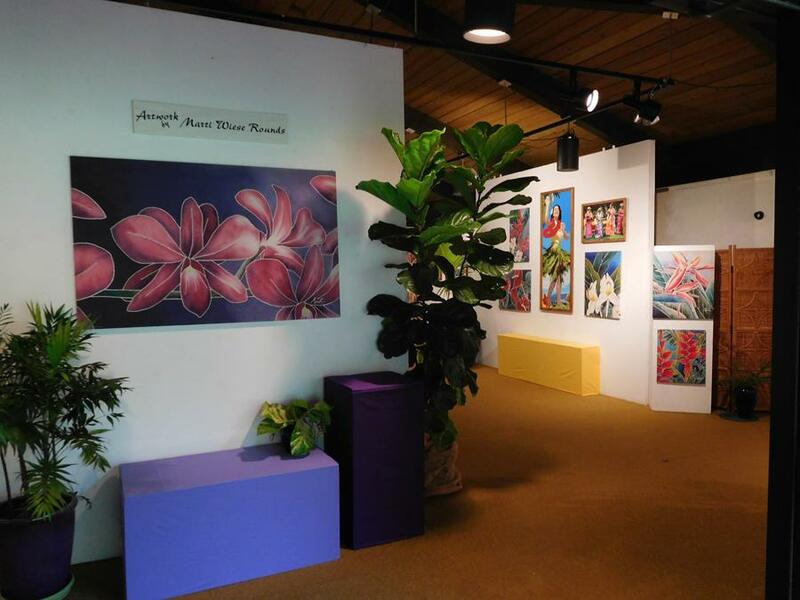 Marti’s annual Hoomaluhia show will be on display until September 29. Head’s up: next year, Marti will be displaying in June instead of September and she won’t be solo! That’s a big change! Be sure to catch this September 2017 solo show so you can see her latest works and the “classic format” before she changes things up for 2018. Marti will also have a couple of pieces in the annual WAG member show, which is also held at Hoomaluhia. The WAG member show will be on display October 1 – 28, 2017. A reception for the artists will be on Saturday, October 21, 2017 from 4:00 – 6pm. Please come join us in celebration! 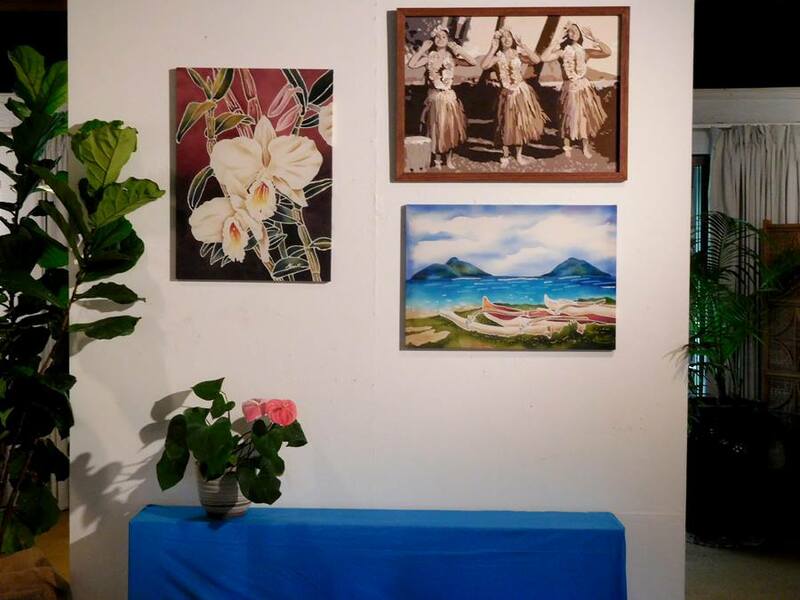 With 49 beautiful pieces in a variety of color schemes, there is something for everyone’s interest, from vintage Hawaiiana, to botanicals, landscapes, paddlers, and hula dancers. The show runs the September 1 – 30, 2016 from 9 AM -4 PM. Marti is there on the weekends and sometimes on Wednesdays 🙂 ENJOY!! Marti has a large show up in the Assaggios restaurant in Kailua. The display will run from March 6, 2016 – June 1, 2016. Don’t miss it! In other news, Marti’s beautiful textiles are once again on the cover of Midweek. 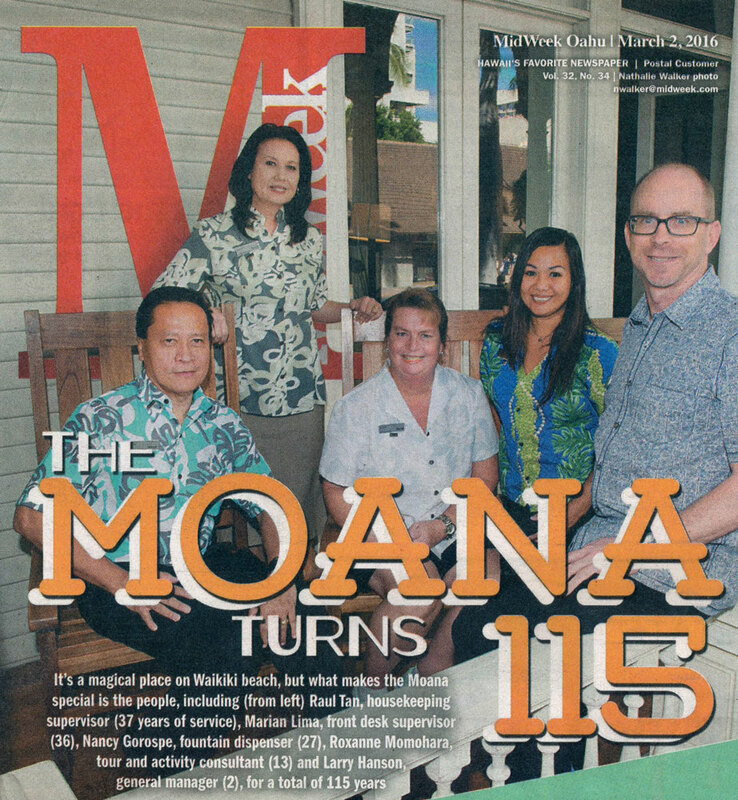 Only a few weeks after her prior Punahou textile was shown on the cover story of Midweek, members of the Moana hotel staff and management were on the cover also wearing Marti’s designs. 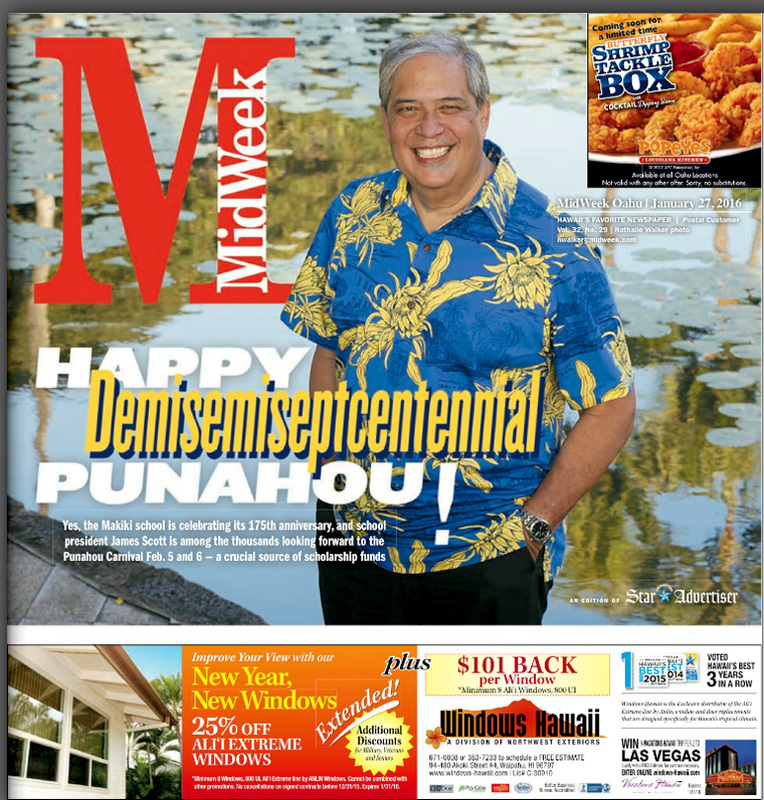 Marti’s Punahou Print on the Cover of Midweek! Marti’s Punahou print, designed in honor of Punahou’s 175 years of educational excellence, is on display all over Oahu now. Dresses, shirts, and accessories all have been made with the beautiful gold and buff material. Most recently, the fabric made an appearance on James Scott on the cover of the latest Midweek from January 28, 2016. Looking great! I’m sure if you go to the Punahou carnival, you will see it many times over the course of your visit to the festive campus! 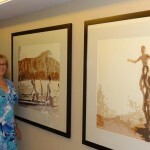 Check out this very fun interview with Marti regarding her process from her batiks and more! Thank you to Leo Hura for the excellent interview! The 175th anniversary textile that Marti designed for Punahou has been very well-received. Featuring the beautiful night blooming cereus in the school’s colors, it is a big hit with the alumni and students. As you can see from the photos, it is beautiful and well-balanced from a distance. It is also gorgeous close up! It has subtle details of the hala trees at the spring and other school imagery in the blue background. It’s very intricate close up, but because of Marti’s design choice to make the details blue on blue, it doesn’t feel busy or distract from the graphic impact of the cereus. Punahou has been hard at work using it for many wonderful products. It’s been a wonderful first half of 2015 for Marti! Marti’s latest art exhibit still has a few days left! It runs (March-June 12) at Assagio’s Kailua featuring her batiks. 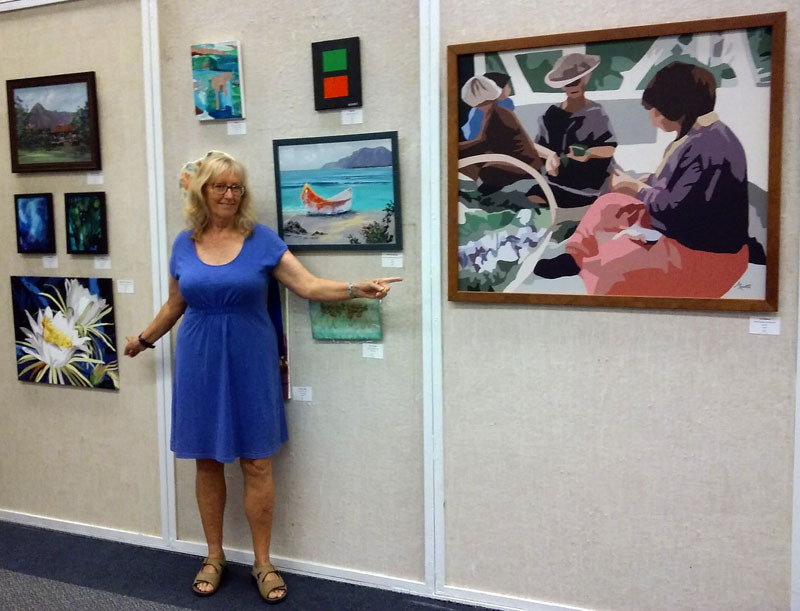 Marti was also juried into the Windward Artist’s Guild exhibition at The Place’s Jardin Gallerie which was on display throughout May of 2015. The current (free) issue of Hawaii Wellness Magazine has images of Marti’s batiks on the cover and the Table of Contents page. Marti will be holding her annual show at the Hoomaluhia Botanical Garden Art Gallery (located at 45-680 Luluku Rd, Kaneohe) throughout the month of September. The beautiful gardens are a fantastic setting for Marti’s batiks and acrylic paintings. She will be featuring new work in both mediums. Please drop by if you have the opportunity and enjoy the sophisticated color palletes of Marti’s beautiful work! 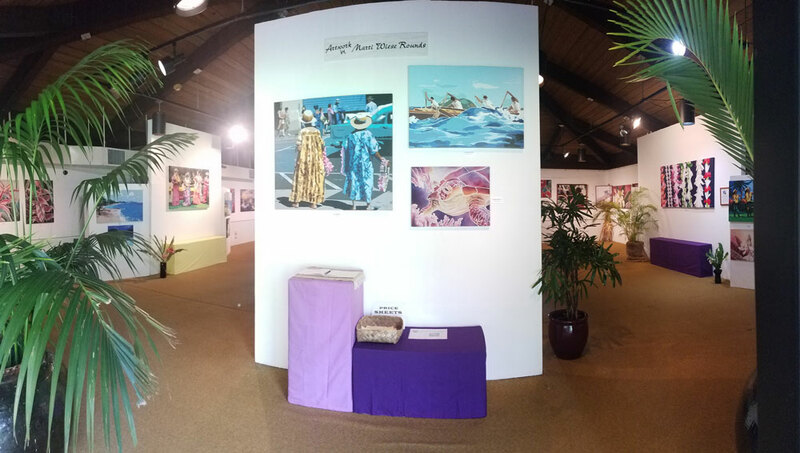 Kailua artist’s “Retro Hawaii” exhibit at Ho‘oma- luhia Botanical Garden gallery showcases beautiful paintings of the Waikiki Beach Days of the 1930s and ’40s, as well as the ’60s. Modernistic is the term Rounds uses to describe her artwork, which has a somewhat abstract rendering. “I say it because you can still recognize that it’s a person, or it’s Diamond Head, but it’s done in a different way. The way that I rendered them, you can’t tell who’s who. For more than 15 years, Rounds was the stylist and colorist at G. Von Hamm Textiles, but during her time here she never created any art. “I always had a whole art staff that did everything, and they’re very good, so I was intimidated,” she confessed. But since her time there, she has followed her own path as a freelance textile artist, creating many works that bring a sense of peace to the viewer. “Retro” also features Rounds’ fabric florals, in which the dye that goes on to the canvas becomes like watercolor. The show is open through Oct. 3, and the public is invited to watch Rounds demonstrate her techniques from noon to 2 p.m. Sept. 29-30. 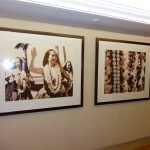 For more information, email the artist at marti@inparadise.com or call 233-7323. Thank you to everyone who attended this year’s show at Hoomaluhia. It was great to see everyone at the reception! We have a YouTube video – a Quick Kine KJK production detailing the show for those who could not be there. Take a look and you’ll see some of my newest works.